Introducing PDD and IMAGE1 S guided diode laser treatment of intermediate-risk non-invasive bladder tumors to the outpatient department. Aim: To move treatment of intermediate risk non-invasive bladder tumors to the outpatient department. 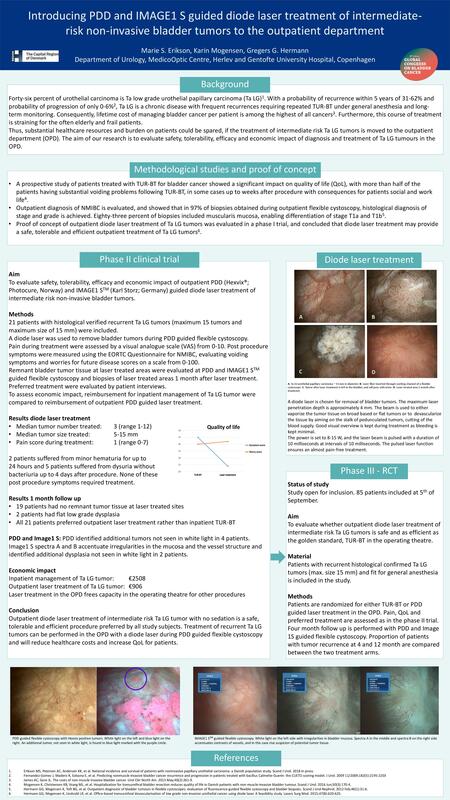 Method: For adequate identification and histologically verification of NMIBC in an outpatient setting, Hexvix® PDD guided flexible cystoscopy and bladder biopsies was studied and validated. A new method to devascularize and vaporize bladder tumors during PDD guided flexible cystoscopy without sedation of the patient was developed using a 980nm diode laser. Treatment could be performed on multiple and up to 1.5 cm tumors. Efficacy of the laser treatment is evaluated with PDD and IMAGE 1STM guided flexible cystoscopy and biopsies of laser treated areas after 1 month. Follow up cystoscopy after 4 and 12 months is performed. The IMAGE1 STM system is applied and evaluated during treatment and follow up cystoscopies. Tolerability is assessed by patient pain perception during treatment using a visual analogue scale (0-10) and preferred treatment using patient interviews. Post-procedure symptoms and future worries are evaluated using the EORTC Quality of Life Questionnaire for NMIBC (score 0-100). An economic analysis of outpatient laser treatment versus standard TUR-BT has been performed. Results: From tissue samples obtained under PDD guided flexible cystoscopy, diagnosis of stage and grade were possible in 97%. Muscularis mucosa were present in 83% of biopsies and muscularis propria in 35%. 21 patients with recurrent intermediate-risk Ta low grade bladder tumors were included in a phase II trial for outpatient diode laser treatment. Median pain score was 1 (range 0-7). All patients preferred laser treatment. Median symptom score was 24 (range 0-67) and median worry score 42 (range 0-100). Two patients had minor hematuria and 5 had dysuria after laser treatment. Nine-teen patients had no remnant tumour tissue at 1 month follow up but 2 had flat low-grade dysplasia. Five patients had new tumor recurrence within 13 months, none progressed. Compared to white light cystoscopy, PDD identified additional tumor tissue in 4 patients, and IMAGE1 STM additional flat low-grade dysplasia in 2 patients. The direct cost of inpatient management of Ta low grade bladder tumor versus outpatient laser treatment was estimated to €2508 versus €906. Conclusion: Outpatient diagnosis and diode laser treatment without sedation of intermediate risk Ta low grade bladder tumors is safe and efficient. Outpatient diode laser treatment is currently tested in a randomized phase III trial. Conflict of interest: Photocure has sponsored a research grant for the use of Hexvix® in PDD guided flexible cystoscopies in our phase II clinical trial.